Choose an experienced professional photographer- not someone who’s “just starting out.” Experienced pros know which shots are important and can’t be missed! Then you don’t have to worry about it on your big day. 2.) Communication. This one’s huge! 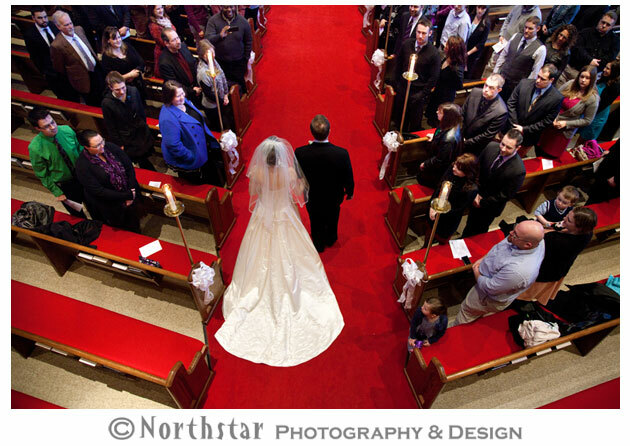 Make sure you and your photographer discuss what’s important to you about the photography. Special picture requests should be made in advance- one less thing for you to remember on your wedding day. 3.) Plan your day with enough time for travel between locations and time for the photographer to get some great shots. 4.) 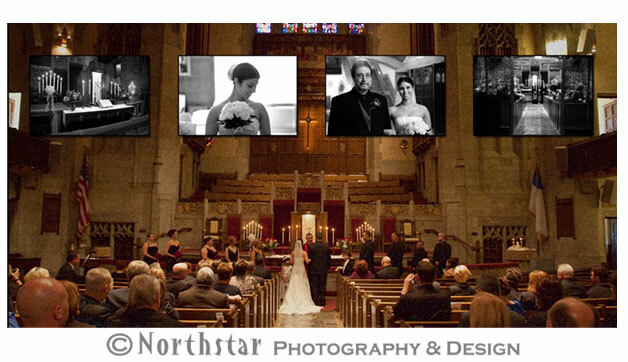 Look at entire weddings from the photographers you’re considering. Anyone can take a pretty picture once in awhile, but only a pro can capture the entire day beautifully, from start to finish, every time. 5.) Don’t get hung up on stylish “editing.” Many photographers rely on Photoshop gimmicks to make their work interesting. Instead: look for great expressions, great lighting and great composition. Tilting the camera and turning the picture yellow is not Art. 6.) Check the photographers’ Google reviews: great reviews are hard to get, and usually reflect a great reputation earned by making customers happy–every time. 7.) Personality. 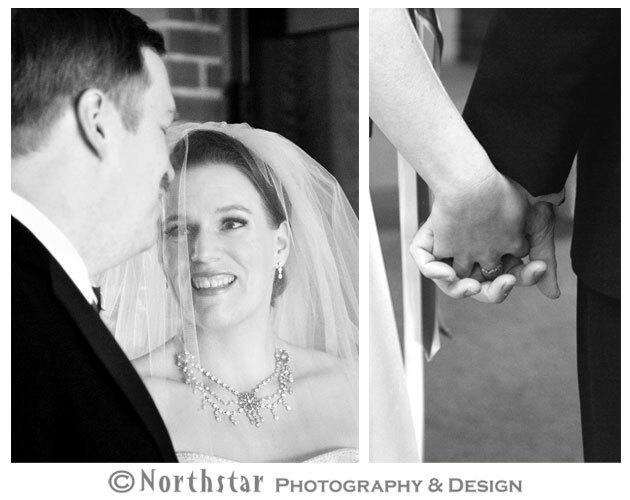 Is your photographer friendly, fun to be around and genuinely interested in you? A really great photographer wants to hear what you have to say and learn about your personality. Only then can he or she portray you in a natural and flattering way- you want to look fabulous, right? What are the most important Wedding Photographer Tips? 1. First, understand that wedding photography is an investment. Everyone you know will look at your wedding images- probably online and in an album. Your children will look at your wedding album someday! This is a very important part of family history, and you can’t call “do-over.” Saving five hundred dollars on photography so you can have fancier centerpieces won’t make sense in the long term. The quality of the images and how they are presented will last a lifetime, and you’ll never regret spending enough to do it right. If you don’t have good reasons to trust your wedding photographer, you won’t be able to relax and enjoy your wedding day! Some of the following tips are related to trust as well. Make sure you feel comfortable with the company you choose. 2. Budget is always an issue, whether your budget is large or small. A good company should be able to provide you with good quality and have flexible packages to suit most budgets. 3. 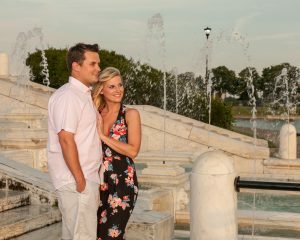 An Engagement Portrait session is a great way to develop a good relationship with your photographer. You’ll not only spend some time together and begin a working relationship, but you’ll see some results: that should help you develop some trust in his/her skill and creativity. 4. Personality is very important. After all, you’ll spend a lot of your wedding day together. 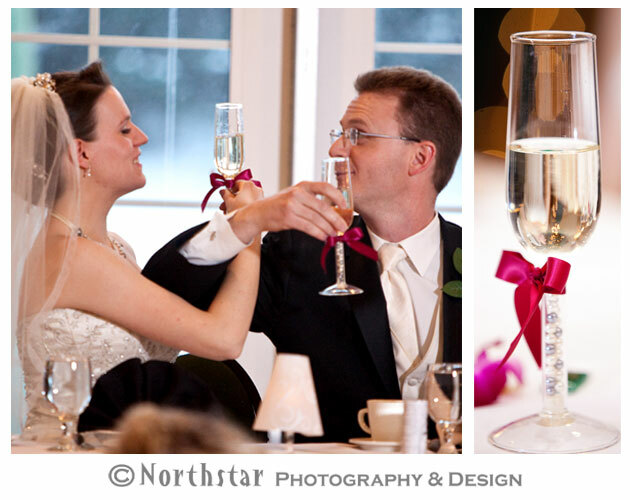 If you don’t enjoy your photographers’ personality, you haven’t found the right person to photograph your wedding. 5. Ask about experience. 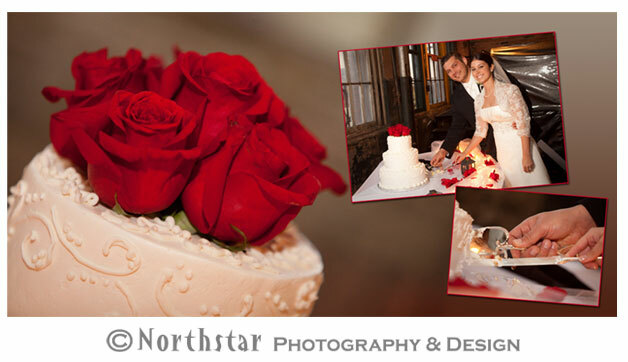 Your wedding photographer should have many years experience from dozens or even hundreds of weddings. 6. Find out what professional organizations they belong to: membership in professional organizations are a good indication of the photographers’ dedication to his/her craft, and most professional organizations emphasize ethical business practices. 7. How about back-up? Does your photographer have plenty of back-up equipment on your wedding day? 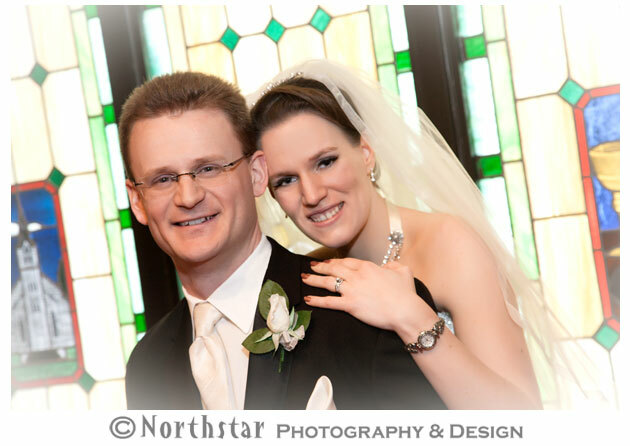 Ask how your wedding day digital image files are backed up. 8. Photojournalism or Portrait Style? You may have a preference for candid “in-the-moment” shots, or prefer the more classic, elegant posed images. 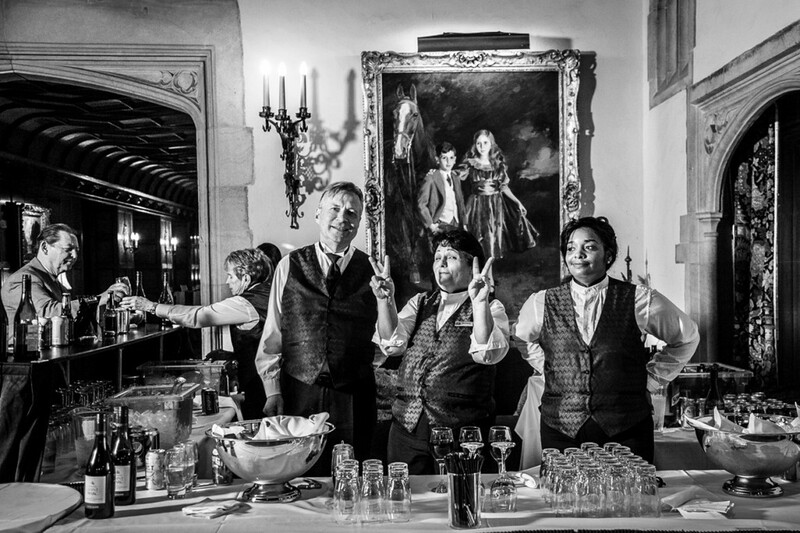 Whatever your preference, look for two photographers working together- one photojournalist and one portrait artist. The fact is: you need both. A single photographer can’t be in two places at once, and you need a balance of both styles to really tell the story of your day. Many photojournalists can’t or don’t use advanced lighting techniques or don’t know how to pose. You need these skills if you want great looking group shots, and beautiful romantic images with great lighting. 9. Look for great lighting and composition. Do the images look well composed, with directional lighting like you would see in a painting? If the images look like what your friends take with their phone- run away. 10. Ask to see whole weddings, not just “best of” collections. 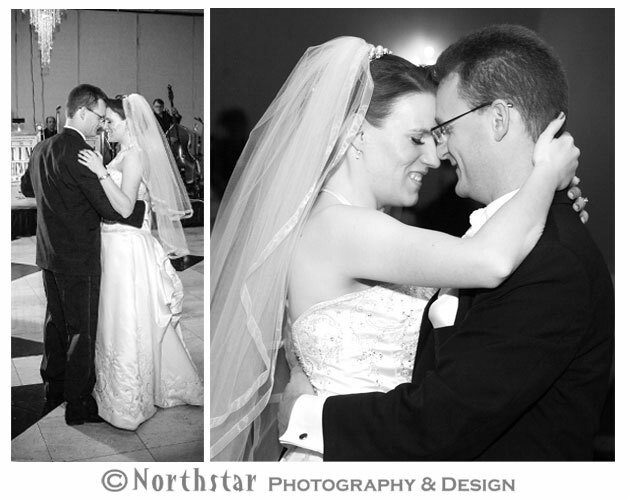 Great photographers tell wedding stories from beginning to end. 11. Look for beautifully designed, high quality albums. Are the pictures arranged in an artistic way? Does the album tell a wedding story beautifully and with impact? 12. Finally, make sure you can communicate with your photographers. They should be friendly, open, and good listeners. This is your day and your opinions and wishes should be heard and respected. If your photographers meet all these criteria, you can relax: you’ve made a great choice. Now you can look forward to having fun on your wedding day! 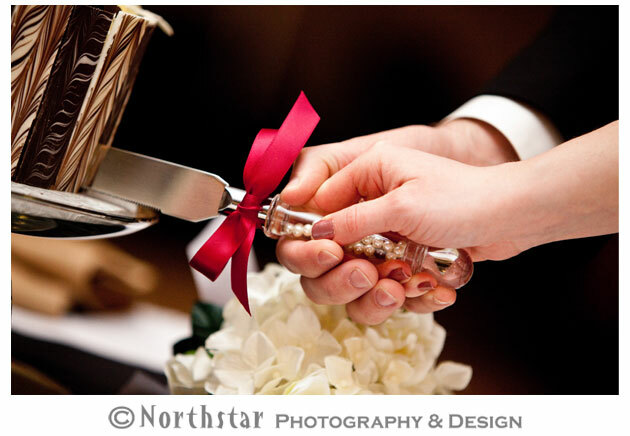 Northstar Photography provides expert wedding photography to Farmington, Farmington Hills, Novi, Northville, and surrounding Michigan cities. Call us today (248) 850-2486 for more information. 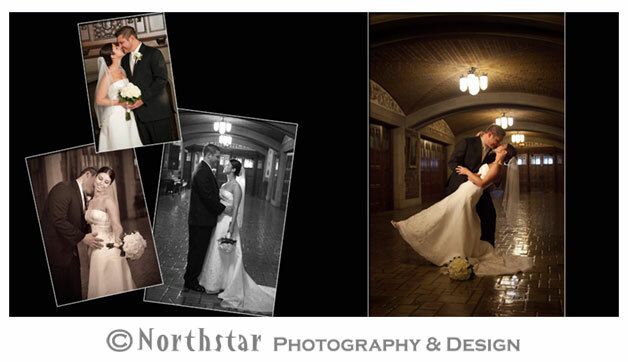 It can be difficult to choose a wedding photographer in Southeast Michigan and feel like you’ve made the perfect choice! Which wedding photography style is “right” for my wedding? Natural light vs flash photography? Do I want to “pose” for my wedding pictures? These questions are all good ones and there are many more. 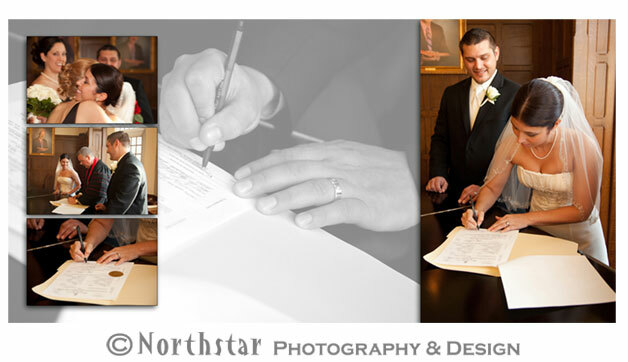 Here are some important points to review with a photographer before you hire them for your wedding. Experience. If you needed a medical operation you’d make sure your doctor had lots of experience, wouldn’t you? The same is true for a wedding photographer. Just because you have a great digital camera doesn’t mean you know which pictures to take, or where to be and when in order to capture great candid moments of a wedding day. Don’t let your perfect day be lost to inexperience: choose a professional wedding photographer for peace of mind and masterful coverage. 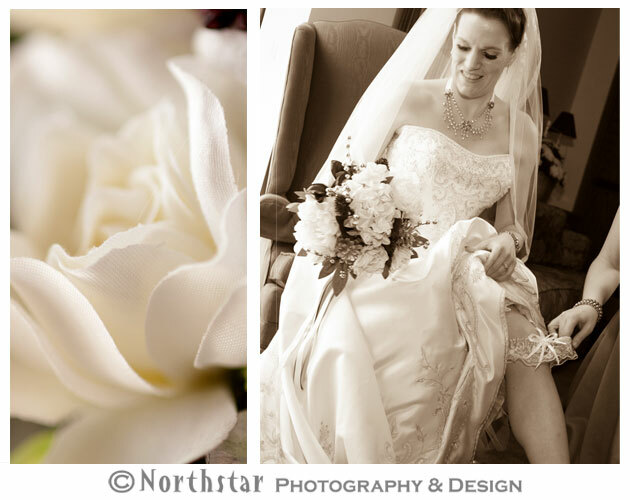 Candid wedding photos can be beautiful story telling images IF they are composed well and have attractive lighting. Or they can look a lot like snapshots if they’re not skillfully crafted! Look for candid photos with nice, natural lighting and avoid the ones that look like they were lit with an on-camera flash. When you hear the phrase “posed wedding photos,” you might visualize pictures where people look unnatural, stiff, over- dramatic or even corny! Yuck! Other than traditional group portraits, wedding photos composed by an artistic wedding photographer don’t look posed at all. They look natural and beautiful- even candid looking, and have incredible lighting, great backgrounds and a pleasing composition. 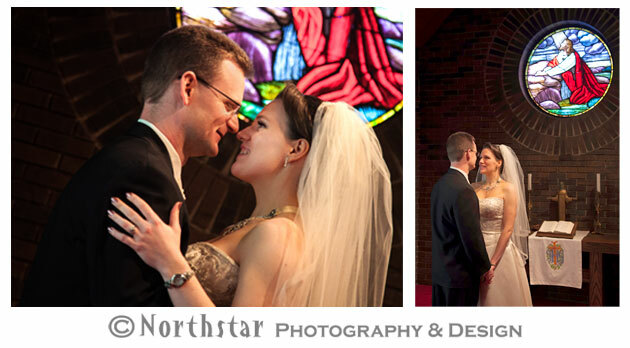 So don’t be scared of posed wedding photos- just choose a photographer who knows how to do it well. These are likely to be the pictures you’ll frame and put on the wall. Outdoor locations can add a nice touch to your wedding photos. 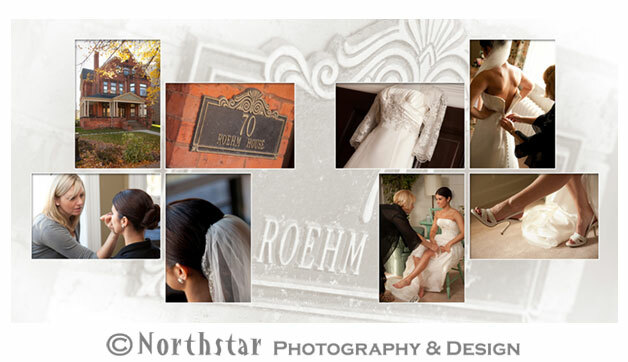 There are many great places in Livonia, Farmington, Farmington Hills and Northville for creative wedding photography. 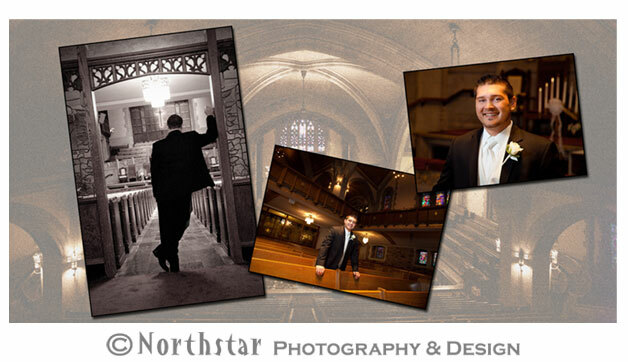 Make sure you choose a photographer who’s familiar with your area. 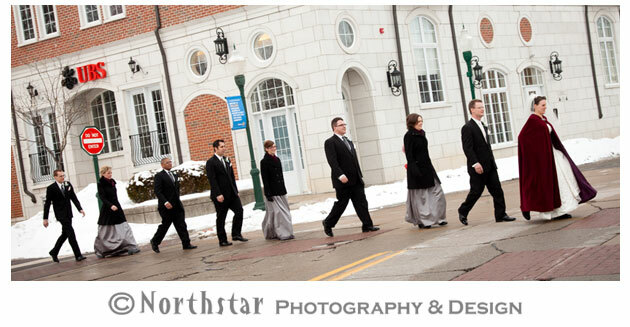 Plymouth and Ann Arbor are two more towns that are great for artistic wedding photography. Outdoor wedding images can be awesome and memorable, and taking them can be a lot of fun for you and your bridal party. Lighting and composition are two elements of photography that separate amateur snapshots from artistic photographs. Sure, there are “rules” and techniques that can be applied, but even without knowing these, many people can recognize inspired work. If your eye is somehow drawn to the main point of interest and then you find yourself studying the image looking for highlights, textures, shapes…chances are good you’ve found good composition. If on the other hand, the subject of the picture is dead center in the frame and it’s obviously lit by a flash- well, maybe a friend took that one. Here’s an often overlooked, but important factor to consider–personality. Is your photographer a good match for you and your fiancé? Good sense of humor? Patient or pushy? Fun to be around, neutral, or just kind of dull? Everyone’s got a good match–make sure you’d enjoy spending your most important day working with him or her. Finally, there’s planning and communication. 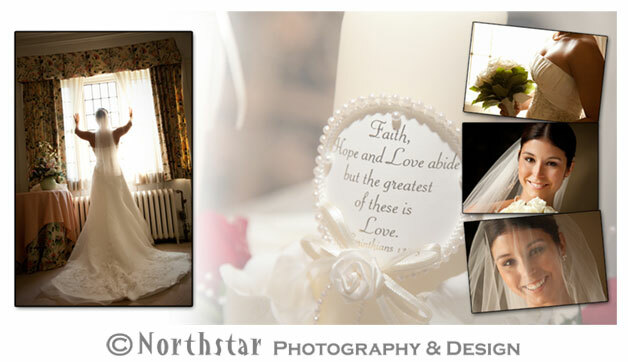 Is your wedding photographer interested in you, your fiancé and your dream for your wedding day? Does he or she ask for your input on the pictures–your likes and dislikes? Do they offer to meet with you again and plan the timeline for your wedding day photos? If you answered yes to all these questions, then chances are good you’ve found someone that’s really dedicated to your satisfaction. I hope this is a helpful guide for you. If you have more questions, ideas or suggestions, please call or email us at the studio in Farmington Hills. I’ll be happy to hear from you. Thanks, and Happy Wedding! It’s the season for engagements (thank you Christmas and Valentine’s Day!) 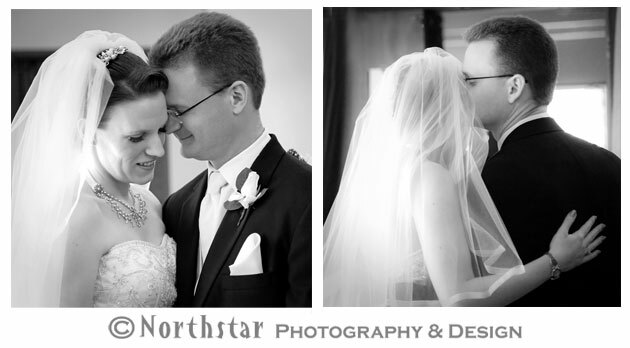 2015 will be an incredible year for Northstar Photography & Design’s wedding photographers’ calendar (aka John and Cheryl Tree). We’ve already booked another two events this week (and we can’t wait to photograph those amazing weddings in Livonia, MI and Farmington Hills, MI)! That’s where the combined art of wedding photography and photojournalism comes in: knowing how to secretly photograph Dad tearing up and then creating exquisite portraits of the bride and groom against a garden backdrop. Plus having the people skills to convey the emotions with the experience and technical talent to carry it off! 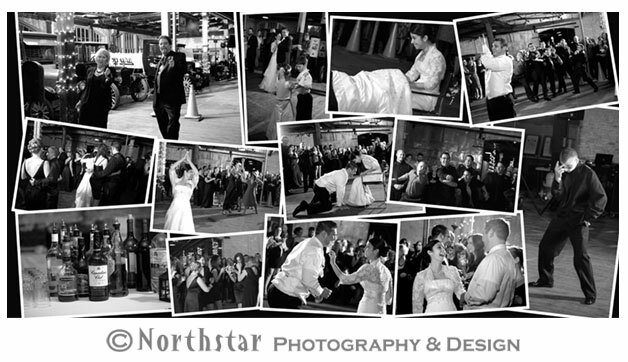 It’s the best of both worlds for photographing your incredible wedding and that’s one of the many ways Northstar Photography & Design can make your wedding day worries evaporate. Complete and effortless coverage resulting in meaningful images you will cherish forever! 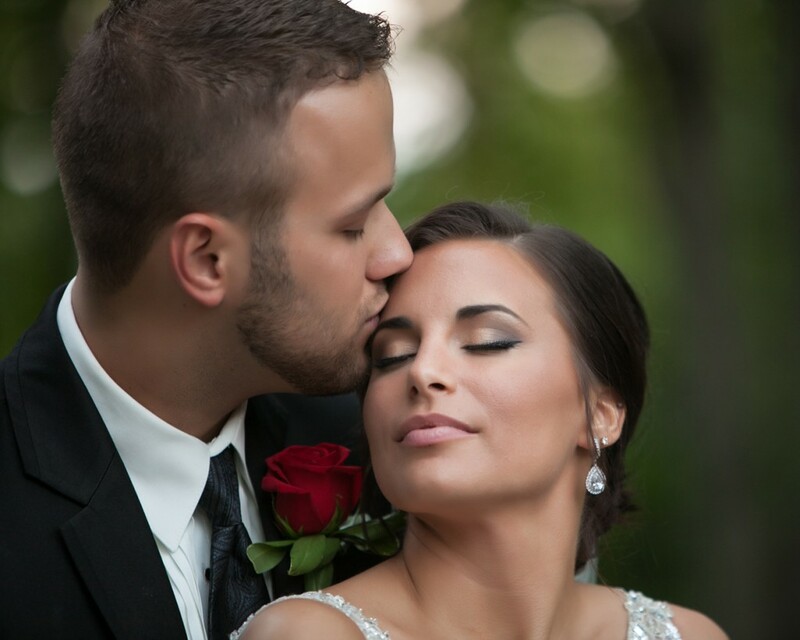 Want to make your wedding day photos spectacular? Contact us and we’ll show you how. 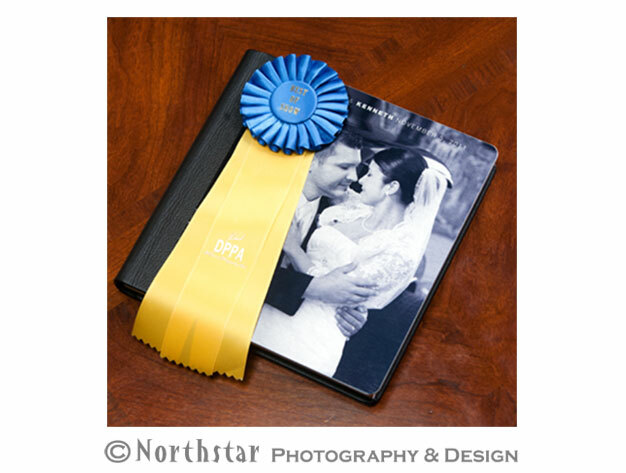 Northstar is Best in Show for Wedding Album Design! What a wonderful finale for the enchanted Detroit, Michigan wedding of Christine and Ken Douglass! 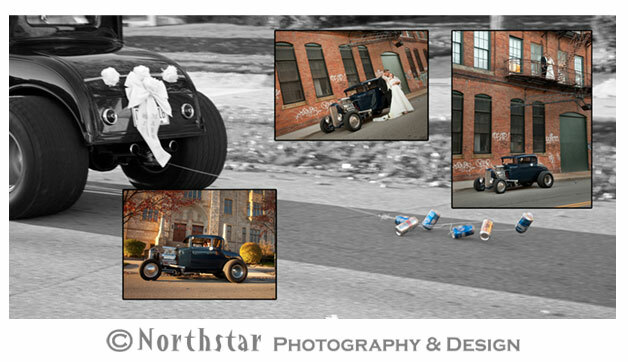 Northstar Photography and Design has won Best in Show for the 2014 Detroit Professional Photographers’ Association’s Album competition. Congratulations to John and Cheryl Tree for their artistic wedding photography and to Cheryl for her amazing wedding album design. We’re so proud of the studio’s work and we’ve shared some of the pages below. The Douglass’ were married at the historic Metropolitan Methodist Church in Detroit, MI and the wedding reception was held at the Detroit Model T Plex Museum. 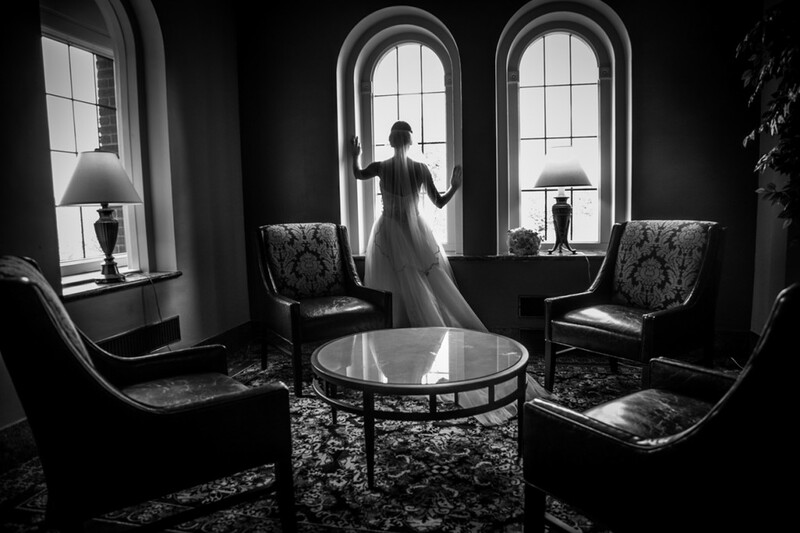 Detroit is a perfect setting for incredibly memorable wedding photography! 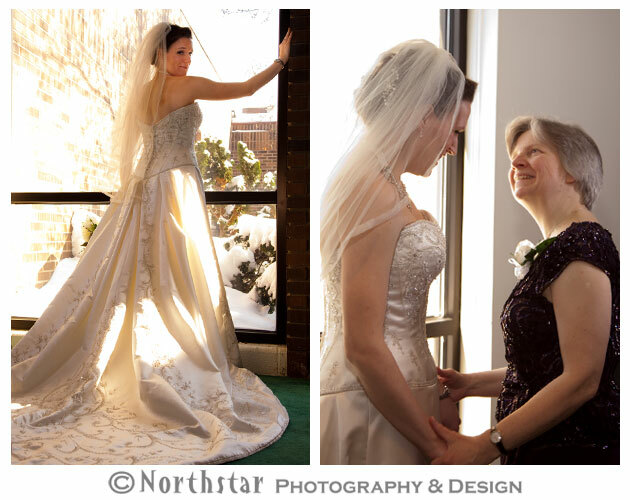 February proved a perfect month to photograph a wedding in Livonia Michigan despite the polar vortex! It was a delightful day to celebrate two new friends of ours–Crystall and John Rumbell. 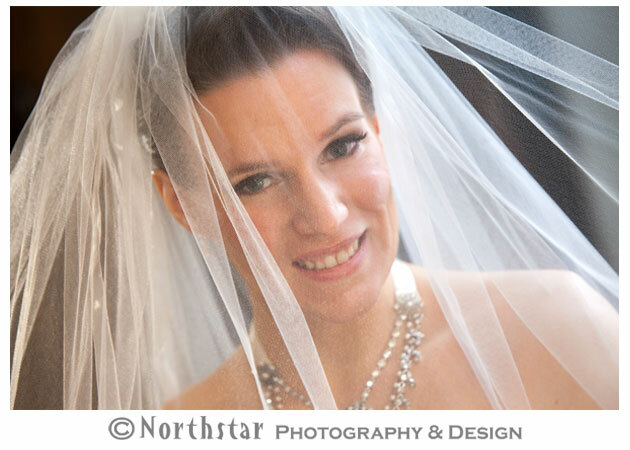 We began with Crystall at Christ Our Savior Church in Farmington and photographed the bride getting ready. 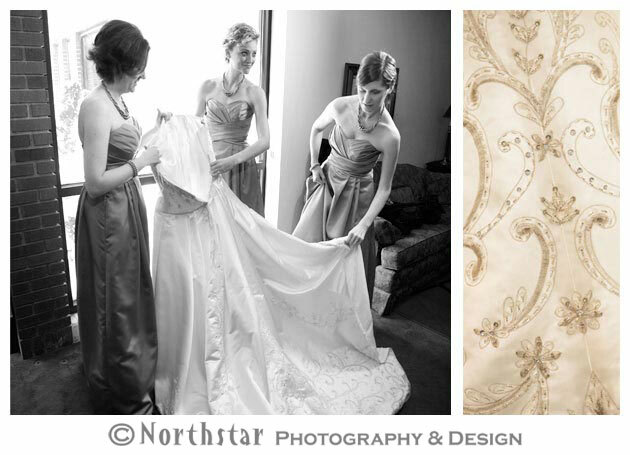 All the preparations were creatively captured by Cheryl: photos with wonderful emotion and beautiful bridal portraits. The guys were next. Candid storytelling and handsome portraiture are best when combined with spontaneous moments. 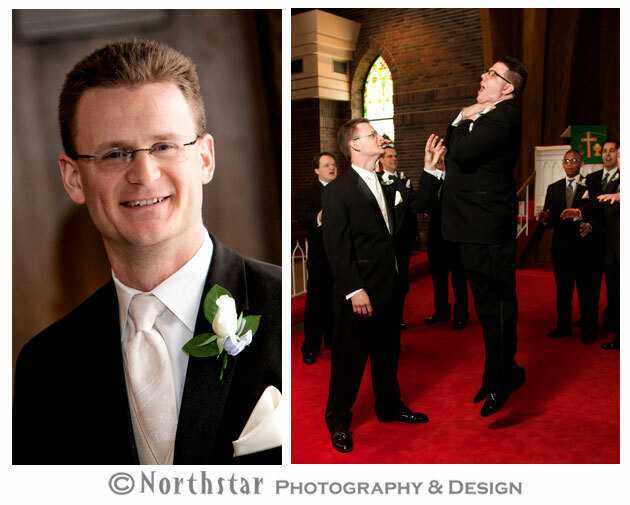 John obliged by demonstrating his eerie powers as he “Vaders” one of the groomsmen! An incredibly special time for everyone was when we visited Crystall’s Grandparents’ house in Livonia. 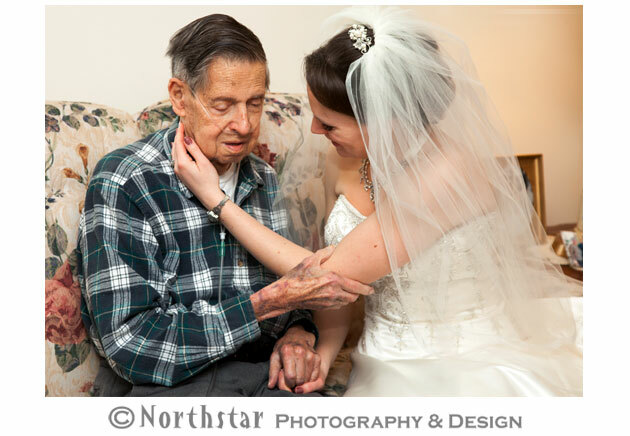 We photographed Grandpa viewing the wedding dress since he couldn’t attend the ceremony. He was so pleased to see her and they had some truly priceless moments together. Then we moved the wedding party on to Kellogg Park in downtown Plymouth, MI, where we photographed the delightful bride and groom with their entertaining party. 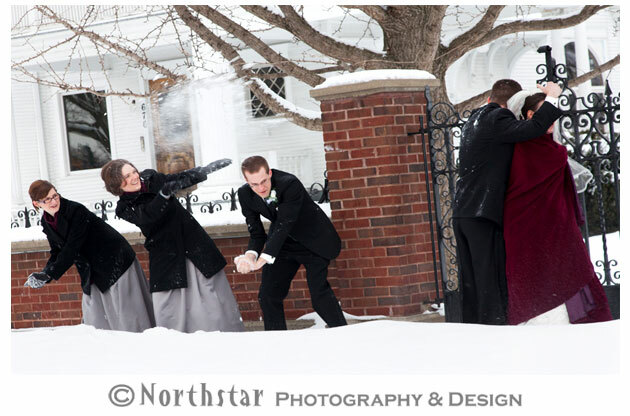 I think this might be a Northstar Photography and Design’s first wedding snowball fight! Finally we headed to the beautiful reception at the Italian American Banquet Center in Livonia, MI. 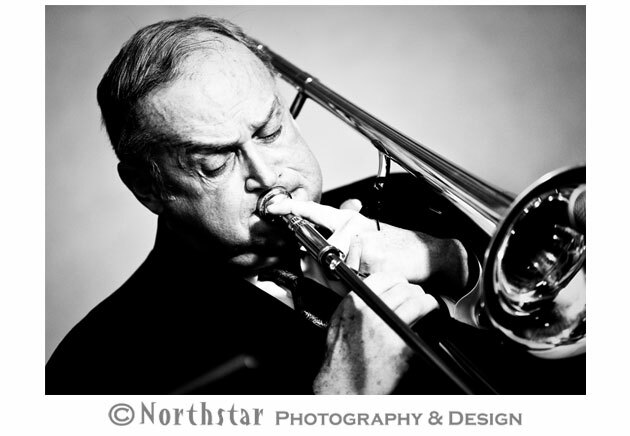 Both John and his Dad play trombone and Crystall is a singer, so it was only fitting that the reception had a musical theme. 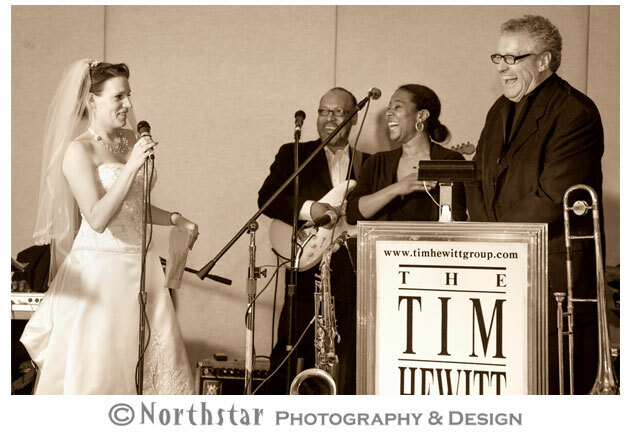 Crystall sang beautifully for her new husband, accompanied by the great Tim Hewitt Group. 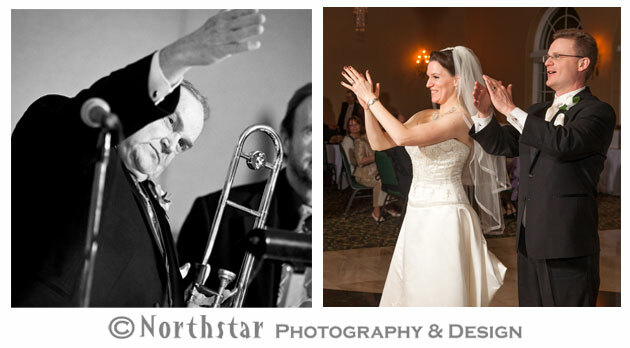 Dad sat in on trombone to make Crystall and John’s first dance even more memorable. 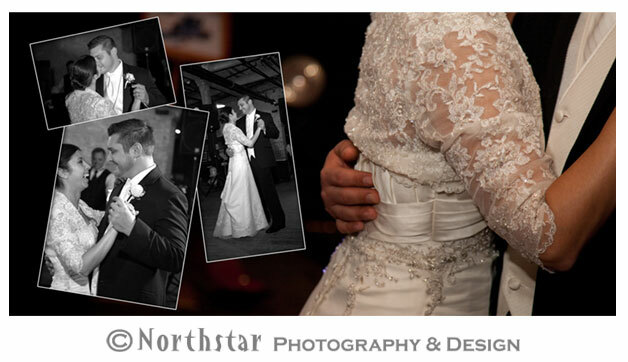 Everyone enjoyed the day and we photographed lots of priceless wedding moments and many romantic images. 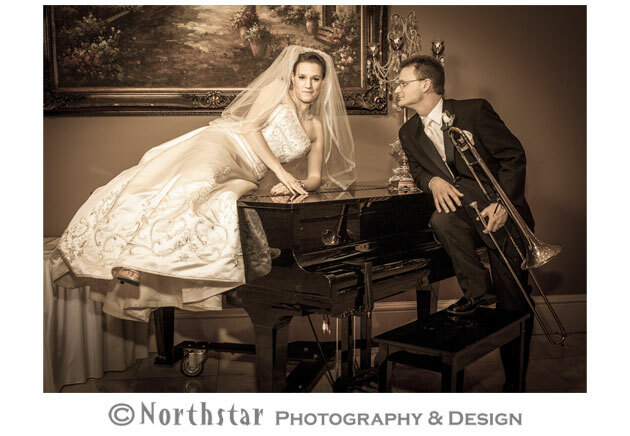 One of our most favorite photographs is of the bride and groom by the piano- what a gorgeous wedding photo for their album! 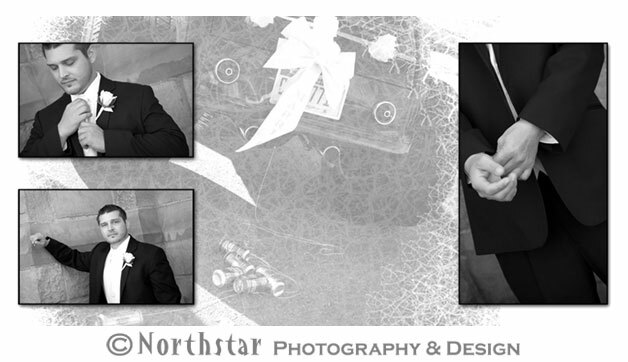 Contact us today to book your wedding photo consultation.